The Lenis Pack is designed by Emanuele Bianchi for pet owners who like to keep their small pet close. The signature checked stitching on Mocha micro-fiber suede is lined with a soft and stylish orange nylon fabric. Easy Velcro closure top keeps your pet secure and safe. Straps can be adjusted to carry on front or back. 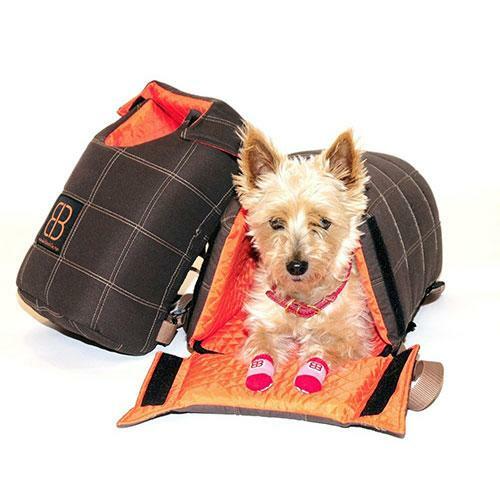 Lenis Pack also makes a comfortable spot for your pet to relax wherever you go. Includes inner safety leash. Your pup fits snugly inside and the adjustable straps let you wear this bag as a front or back pack. The hood of the Lenis Bag is designed to let your happy companion peek out and take in the fresh air. For short rests the carrier can be placed on its back and doubles as a small pet house. Great for short breaks and stretch time for you and your pet. Includes inner safety leash. The Velvety Lenis Pack pet carrier is a combination of velvet tones, is elegant and stylish, and extremely comfortable for your pet. Color combinations include espresso with a stone interior, stone with a sage interior, and sage with a stone interior. Any choice is sure to complement any palette.